Apple has admitted to intentionally slowing down older iPhones, but it's not a sinister plot to entice people upgrade their phones. No, this is for your own good, according to Apple. An automatic software update throttles the processors of older iPhones whose batteries are degrading, ostensibly in an effort to forestall random shutdowns that could damage components. Or, Apple could make the battery user-replaceable. Two lawsuits have already been filed. 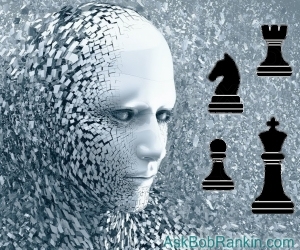 The latest artificial intelligence program, developed by another artificial intelligence program, is freaking out computer scientists and chess grandmasters. “AlphaZeros,” an AI coded by IBM’s DeepMind AI, taught itself chess from scratch in 24 hours and created moves that have never been seen in the game’s history. “It doesn’t play like a human, and it doesn’t play like a program,” said one expert. “It plays in a third, almost alien, way.” Lets hope it understands the subtle difference between "winning" and "eliminating your opponent." A man was arrested after threatening a company with “cyber attacks” unless it fired one of its employees and hired him to replace her. That’s not how job interviews work son. Most Canadian tech story of the year: GoalieUp is a website and app that helps amateur hockey teams find a goalie when their regular net-tender fails to show up, which seems to happen quite often. "I was running from one rink to the next, averaging a game or two every single day," says one goalie-for-hire. A transparent, flexible power source suitable for implantation in human bodies could power heart pacemakers, drug dispensers, and other active medical devices. The synthetic material was inspired by the bioelectric organs of electric eels. Nice to know ya… Converting Bitcoin into real-world currency now costs over $20 per transaction, driving a spike through the hearts of several micro-payment startups and prompting e-commerce firms to drop the cryptocurrency as a payment method. A giant Tesla battery stunned electricity industry experts in Australia. When a coal-powered generating plant 1,000 km away tripped offline without warning, the battery instantly responded with a 7.3MW injection into the network that saved the day. No one knows why. Microsoft has removed Google’s Chrome installer from the Windows Store, pretty much ensuring the failure of Windows 10 S, the security-centric version that allow only Windows Store apps to be installed. Facebook will soon ask your permission to recognize your face, compare it to photos uploaded by others, and notify you if your face is uploaded (even if you’re not tagged) or used in a fake account’s profile. Can we just ban Amazon Web Services, the company’s wildly profitable cloud-computing arm? Data analytics firm Alteryx left the personal info of 123 million Americans exposed to anyone who cared to download it, in the latest of many nearly identical examples of AWS’ negligent attitude towards enforcing security standards. It simply should not be possible for an AWS customer to leave anything unprotected by a password, at least. This just in from the Double-Edged Sword department: “Blue alerts” can now be broadcast to cell phones to alert the public when local law enforcement agents are in trouble, thanks to an FCC rule that fails to consider criminals may rush to the scene to finish off a fallen cop. Android users can disable all but “presidential alerts” in their settings. The stock price of an iced tea manufacturer tripled immediately after the company added the word “blockchain” to its name. Meanwhile, you’re trying to figure out how to make money in cryptocurrency. If you uploaded MP3 copies of songs you legally own to Amazon Music, you have until January, 2019, to download any that you want to keep. The subscription storage service will end then, and all remaining tunes will vanish forever. Unintended consequences… Facebook has dropped its “fake news” tags after learning that the label had the opposite of its intended effect. Seems one person’s “fake news” is another’s Gospel, to be defended against all challenges. A 44-year-old Russian man bled to death after crashing through a glass table while wandering around his home with a virtual-reality helmet covering his eyes. Waze and other traffic apps suggest alternate routes when freeways are congested. That’s causing so many problems on the narrow side streets of residential neighborhoods that one New Jersey town plans to issue $200 tickets to non-residents during morning and evening rush hours. Comcast is accused of adding worthless “Service Protection Plan” insurance premiums to the monthly bills of more than half of its customers, according to a lawsuit filed by the Attorney General of Washington State. Wells Fargo takes notes. Most recent comments on "Geekly Update - 27 December 2017"
DeepMind is not an artificial intelligence program, but a technology company specializing in AI. They, not an AI program, developed the new program Alpha Zero. iPhone batteries are replaceable, just not by the average user. Apple may find it more profitable to advertise the replacement service to customers than throttle the speed. Maybe the thinking is that if they throttle the speed it will encourage people to upgrade to a new iphone. Why anyone would even consider buying a battery powered device, in which it is all but impossible to change that battery is beyond me. iPhones are a total ripoff.